Majority of Filipinos belong to Abrahamic religions such as Christianity as a whole and Islam. 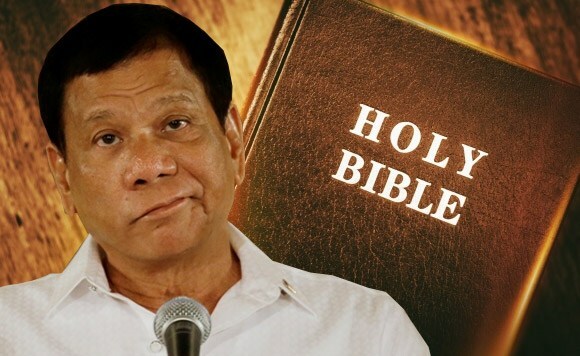 President Rodrigo Duterte is a staunch critic of organized religion and since his presidential campaign, he made several statements and criticisms about God and religion. Recently, his question 'Who is this stupid God' attracted several criticisms among many Filipinos. President Duterte is not necessarily an atheist. He believes in God as a universal mind, an implication that he has the Deistic view of God. He poked fun at the concept of Original sin, creation and the existence of the God of the Bible. His criticisms of God goes hand in hand with his criticism of the Catholic Church especially the CBCP. He even carries and promotes a book titled Altar of Secrets which supposedly debunked claims about the corruption inside the Catholic Church here in the Philippines. Like many of his controversial statements. Calling the Christian God stupid also gave him notoriety in the foreign media.